Sad, but true, another logging operation is planned in a beautiful natural forest (Clack Creek Gallery Forest) on the Elphinstone slopes, where residents have been calling for park expansion. Has the Province, through BC Timber Sales, gained the ‘social license’ to clear-cut another piece of our local forests? Have they consulted you? Forests provide environmental services to you and your family without ever sending a bill: including oxygen supply, carbon sequestering, regulation of water flows, micro-climate, recreation, spiritual fulfillment, wildcrafting and habitat for animals. These forests support a local, sustainable tourism industry; however tourists will stay away from a Clear-Cut Coast. Elphinstone Logging Focus (ELF) is a forestry watch and protection group. To push back on this next marchof logging across Elphinstone, we’re planning a huge group photo shot in the upper Clack Creek area to show opposition to the proposed destruction of this irreplaceable ecosystem. We require concerned citizens to show up, each selecting a tree that resonates with them and standing resolutely in front of it. Photographers will capture a forest scene with dozens of human figures standing at the base of every tree in the picture. Opportunity for kids to partake in a peaceful protest. In addition, participants will be given material to name their tree. The resulting picture illustrates that we’re inextricably tied to healthy forest ecosystems. Please come out for this fun day and spread the word. BCTS Planners will receive a color photo of the completed forest-people scene. 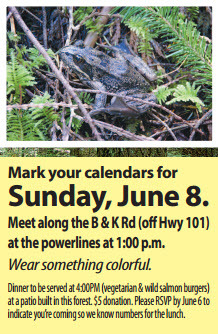 Mark your calendars for Sunday, June 8th. 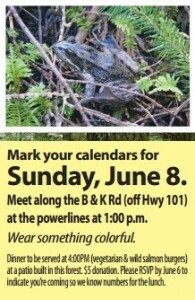 Meeting Place: along the B & K Rd (off Hwy 101) at the powerlines @ 1PM. At 4:00 PM we meet for a luncheon (vegetarian & wild salmon burgers) barbecue at a patio built in this forest. $5 donation. Please RSVP by June 6th to indicate you’re coming so we know numbers for the lunch.